I’ve been eyeing Pillsbury refrigerated cookie dough for a couple months. I always saw it there when I was picking up their pizza dough for my truckload of pizza recipes I’ve been working on. I’d purchased the cookie dough before, but just made cookies with it. That’s all good, but not that exciting. Then I thought what about cookie cups? I have muffin tins already and all I would need is something to fill them with. Trust me, it’s not hard to think of recipe ideas. I’ve got a ton written down now. I just need to find the time to do it! 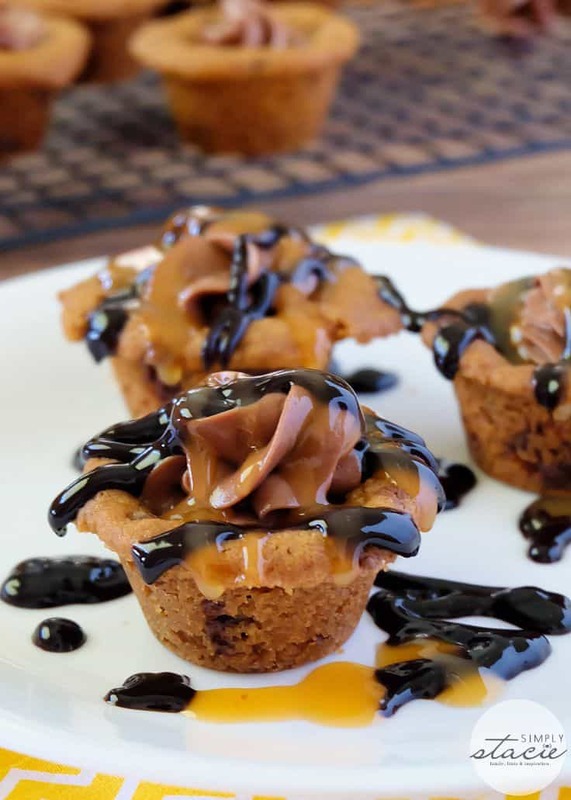 I love how these Gooey Cheesecake Cookie Cups turned out. Like their name, they are ooey, gooey and messy to eat! It’s all good though. Have some paper towel or napkins nearby and dig in. I used Pillsbury Milk Chocolate refrigerated cookie dough for the cup. There is a little extra bit of prep to get them into the right shape, but it’s not hard to do at all. You need to periodically remove them from the oven and deflate the center with a spoon. This step will allow them to take the nice cup-like shape. The filling is an entire package of cream cheese, softened to room temperature, icing sugar and Nutella. Icing sugar is also known as powdered sugar. I learned that a few years ago when some American friends asked me what the heck is icing sugar. I bought a Wilton Cupcake Decorating Kit with disposable bags and decorating tips. It’s easy to pipe in the filling and make it look pretty. If you don’t have a decorating tip or pouch, you can spoon it in the cookie cup. 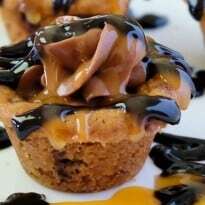 To finish it off, I drizzled caramel and chocolate sauce all over the place. They are bite-sized, but pack a sweet punch! Make sure you refrigerate any leftovers so the filling won’t melt! On a hot summer day like we’ve been having lately, these little guys don’t last too long in the sun. Have you ever made a cookie cup? 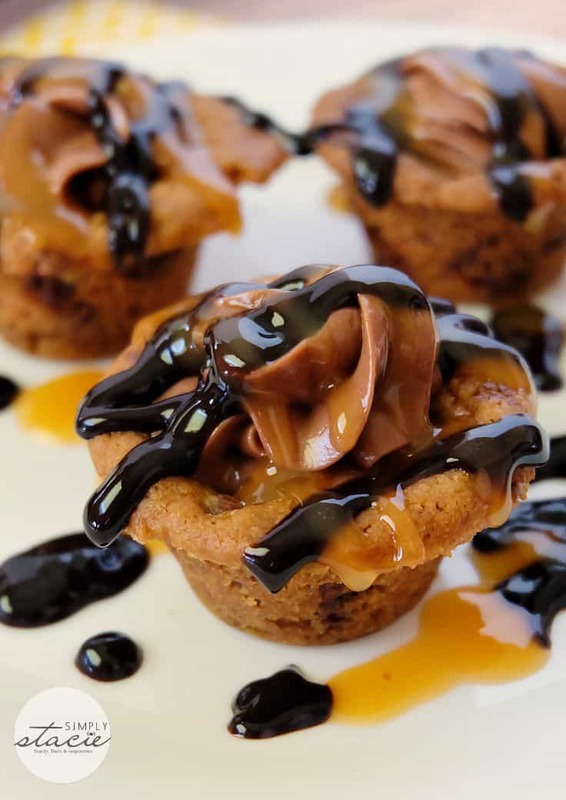 Indulge in these bite sized Gooey Cheesecake Cookie Cups filled with rich creamy Nutella filling and topped with caramel and chocolate. Slice the prepared cookie mix and press each slice into a greased mini muffin tin to form a cup. Bake for about 7 minutes. Remove tray from oven when cups are rising. 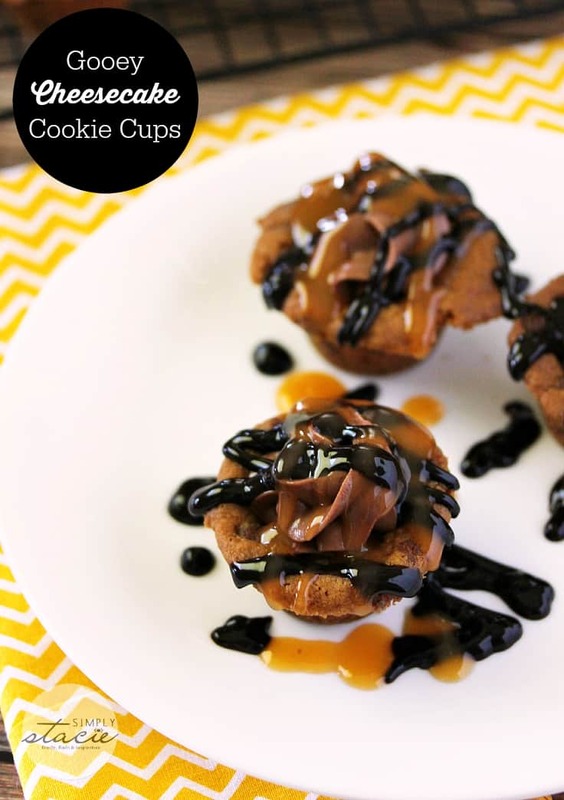 Take a small spoon and deflate the centers of the cups while leaving the sides of the cookie cup untouched. Put back in the oven and bake for another 5 minutes. Again, remove from oven and with a small spoon, deflate the centers of the cups while leaving the sides of the cookie cup untouched. Place back in the oven again and finish baking until the cookie cups are golden brown. Remove from oven and let cool completely. In a mixing bowl, whip cream cheese, icing sugar and hazelnut spread together until light and fluffy. Place cream cheese mixture into a piping back and pipe the mixture into the cooled cookie cups with a decorative tip. Cool in the refrigerator until ready to serve. 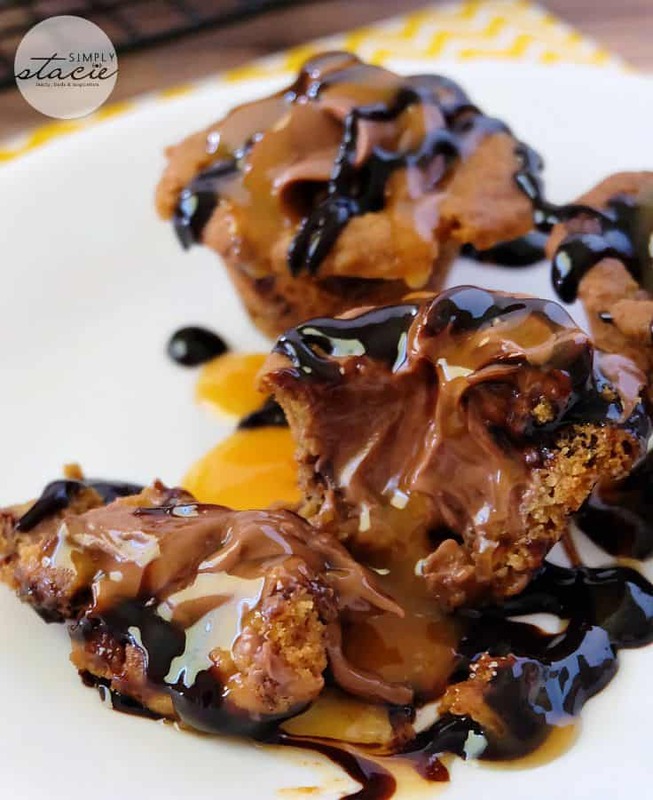 When ready to serve, drizzle caramel and chocolate topping over the cookie cups.